Capitalizing on opportunities, adapting to change and keeping an open mind. All are important principles in the development of any successful business, but they are also essential elements in career development. This is particularly true in the aviation and aerospace where change, creativity and new ways of problem solving are par for the course on a daily basis. This message was ironed home by a number of speakers and panellists at last year’s Careers in Aviation (CIA) Expos in both Toronto and Calgary. Porter Airlines president and CEO Robert Deluce, for example, spoke candidly and passionately about his personal career development – and that of his airline – at the CIA Expo in Toronto, stressing that aspiring aviation and aerospace professionals truly have an opportunity to soar. However, keeping an open mind is critical. “You have to remain open to change and go where opportunity presents itself,” Deluce noted. “And above all, don’t fall prey to those that say you can’t do something – because you most certainly can.” Porter’s success certainly reflects that point. 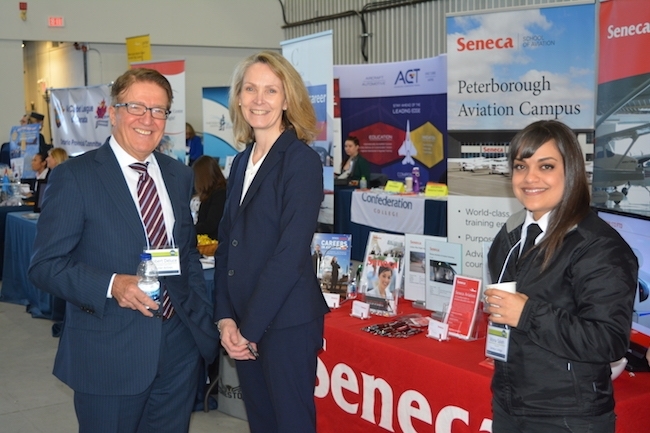 Having the opportunity to hear how some of the nation’s top aviation and aerospace leaders like Deluce have thrived (and stumbled) in the their own careers and achieved success as part of their respective teams, is just one of the benefits of attending one of Wings and Helicopters Careers in Aviation (CIA) Expos. Designed as a live version of the Careers in Aviation print guide that prints in the January/February issues of Wings and Helicopters, the CIA Expos present a tremendous opportunity for students interested in aviation and aerospace careers to rub shoulders with industry leaders from a variety of sectors. Special presentations cover a broad spectrum of pertinent topics including: flight operations/pilots; varied aviation professions such as air navigation, TSB investigation; business operations; what it’s like to be a flight attendant; aircraft maintenance and engineering/aircraft completions; and what information to ask aviation educators/professionals at the many flight schools, colleges and universities that dot the nation. The Wings and Helicopters team is currently lining up this year’s speaker lineup, so please check www.careersinaviation.ca/expo/ for more details.